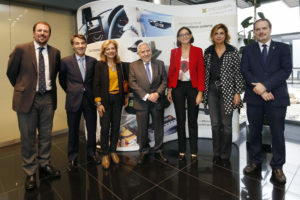 Ficosa, top-tier global provider devoted to the research, development, manufacturing and marketing of high-technology vision, safety, connectivity and efficiency systems for the automotive and mobility sectors, has inaugurated its e-Mobility Hub today. This centre specialises in electromobility systems for hybrid and electric vehicles and is a pioneer at a national and international level. Located in Viladecavalls (Barcelona), the company has invested more than €10 million in this new 1,200-m2 facility, employing more than 120 engineers, 60 of which are new hires. The e-Mobility Hub will become a global benchmark laboratory in the development of electric mobility technology, driving Ficosa’s leadership in an area that is key for the mobility of the future. In this regard, it plays a strategic role, as it will become a driving force in electromobility solutions for the whole group on an international level. Yesterday afternoon, the new e-Mobility Hub welcomed Minister of Industry, Trade and Tourism Reyes Maroto; General Secretary of Industry and Small and Medium Business of the Spanish Government, Raül Blanco Díaz; General Secretary for Business and Knowledge Marta Felip; CEO of ACCIÓ, Joan Romero; and Mayor of Viladecavalls, Cesca Berenguer, that were accompanied by Ficosa Chairman, José María Pujol, and Javier Pujol, CEO of the company, among other Ficosa’s executives. After the visit, Minister Reyes Maroto, speaking with the Ficosa President and CEO, highlighted: “We’re working with the sector, with the whole value chain, on defining a strategic framework that will allow us to develop important leveraging opportunities and you are the ones with the middle- to long-term vision. We have to accompany this transformation in the industry, which is already here and we have just seen at Ficosa. There is no doubt anymore that there will be a disruptive shift in the industry that we must be part of”. The e-Mobility Hub has latest generation premises with four new laboratories certified by ASPICE, the ISO-Automotive SPICE regulations to develop mechatronic systems. At this centre, Ficosa develops and manufactures software and hardware solutions for hybrid and electric vehicles, specifically battery-management systems (BMS) and on-board chargers (OBC). The battery-management system is a device that gives users the required safety and allows them to monitor the battery charge level at all times, as well as its health. On the other hand, the on-board charger is assembled inside the vehicle and charges the battery using an electric cable, directly from a standard alternating current (AC) power socket. Javier Pujol highlights that in 2019 the company “expects to reinforce the team at the e-Mobility Hub with 100 more engineers, as well as adding 750 m2 and another laboratory” in order to satisfy the multinational corporation’s needs as a result of its growth in the field of electromobility. The new e-Mobility Hub joins the other hubs in Connectivity and Safety that Ficosa has in Viladecavalls, which work for the company globally. This way, Ficosa is reinforcing its leadership in strategic products for more aided driving, driverless vehicles, connected cars and e-mobility, which have become pillars of the group’s growth. In this regard, Ficosa has significantly expanded the engineering team working on these new technology products, with a record-breaking 1,170 engineers worldwide. Of these, more than 700 work at the Viladecavalls Technology Centre, the group’s most important engineering centre, which last year alone hired 160 new engineers. The strong commitment to capitalising on innovations and the latest advances in the sector has led the company to boost the resources it puts into R&D, which was roughly 8% of sales in 2017. In terms of the important investment plan the company is rolling out, in 2017 it invested more than €90 million, 50% of which went to new technology. The company expects to put more than €500 million towards new products business between 2019 and 2023.